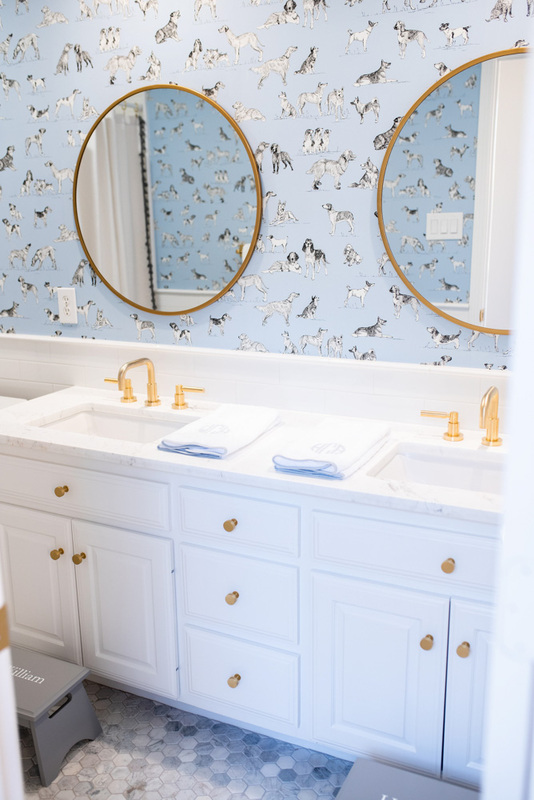 It has been a long time coming, but we are thrilled to be sharing the boys’ bathroom reveal! This is the first of many projects we’ve undertaken in our new house. 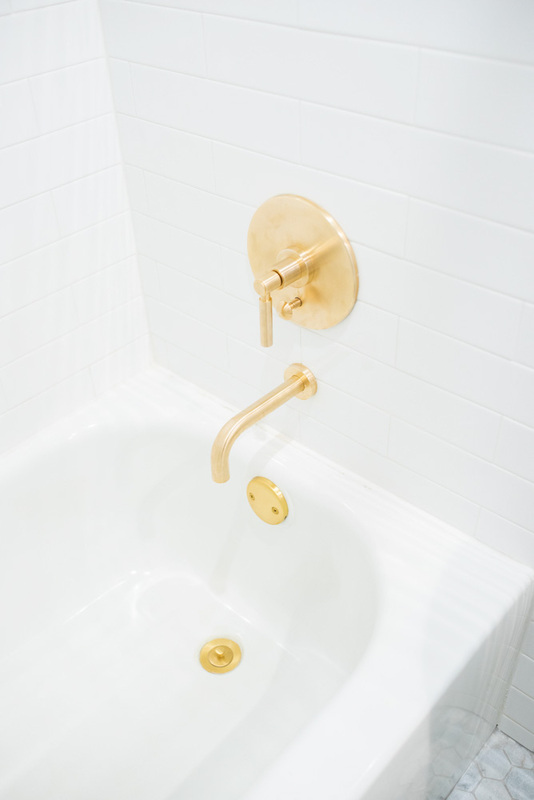 Being that this is the first home renovation my husband and I have done, I was clueless about where to start. Thankfully, we had two months from the time we closed on the house until we hired a contractor. 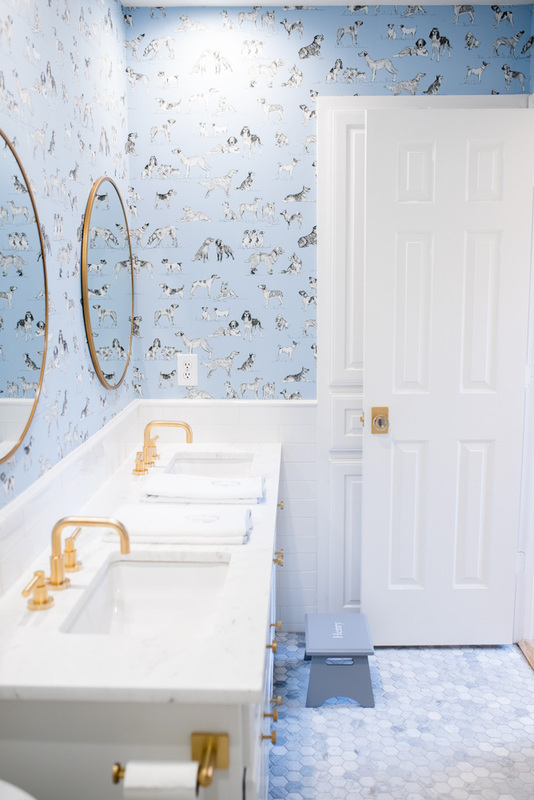 While we found the difficulty in finding a contractor frustrating at the time, that extra time was exactly what we needed to start to look for ideas, find inspiration and make plans for when we would finally be able to start our renovation. 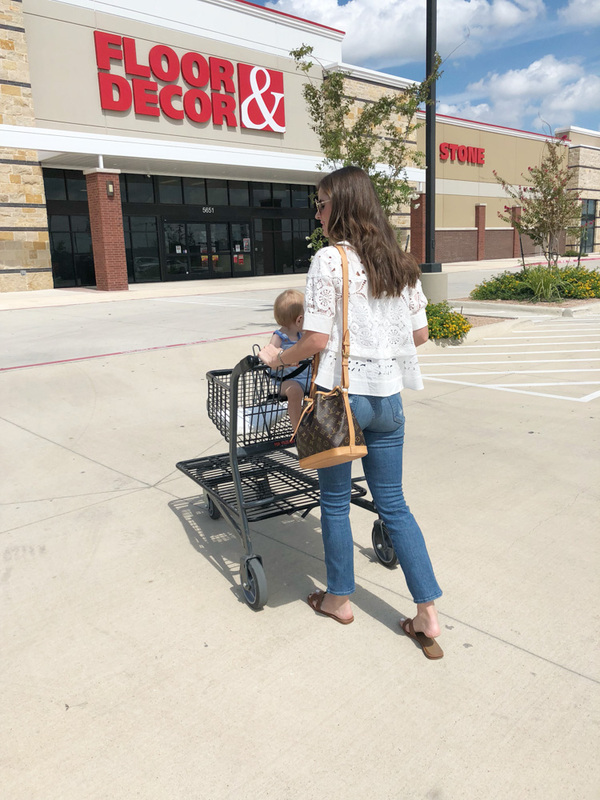 Knowing that we would be replacing all the floors, renovating two bathrooms (we still have one additional bathroom left to do), renovating the kitchen and redoing the built-in and fireplace in our family room – I started to look around for ideas involving tile. While searching for tile stores, one of the ones that came up was Floor & Decor. Floor & Decor also came highly recommended from a few friends that had recently completed some home renovation projects. Floor & Decor is a flooring store that carries every type of tile imaginable; marble, ceramic, porcelain, travertine, etc. In addition to tile, they also carry wood floors. Basically, Floor & Decor is a one-stop shop for everything you need related to tile and flooring and the prices are unbeatable. A huge plus when you see how expensive flooring can be! Our first (of many) visits to the store was to focus on the boys’ bathroom tile. This was the most fun project for me out of the whole house. I’m not sure if it’s because it’s a smaller space or that it just came together easily! 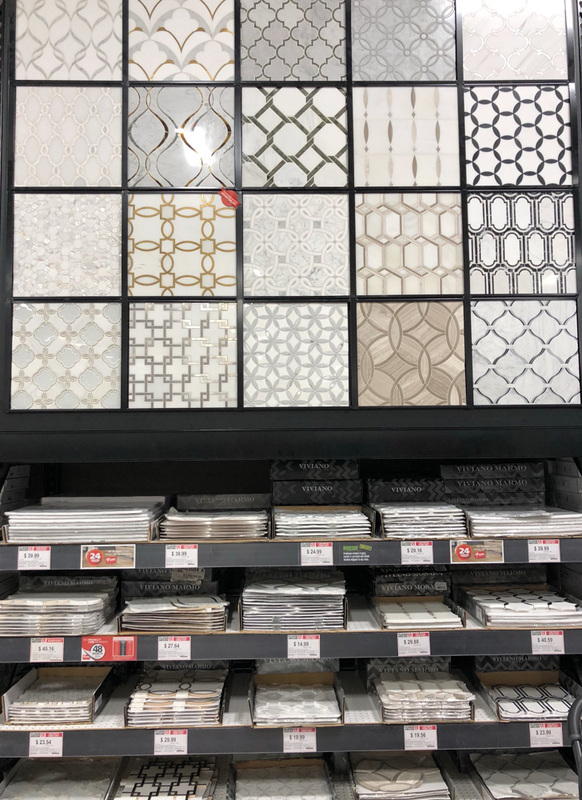 Floor & Decor has great displays with every tile in inventory and there is a free onsite designer that helped me with my vision. She helped source product, select grout and everything was ready that day for my contractor to pick-up. The whole process was so seamless! I knew I wanted to do a mosaic tile on the floor. 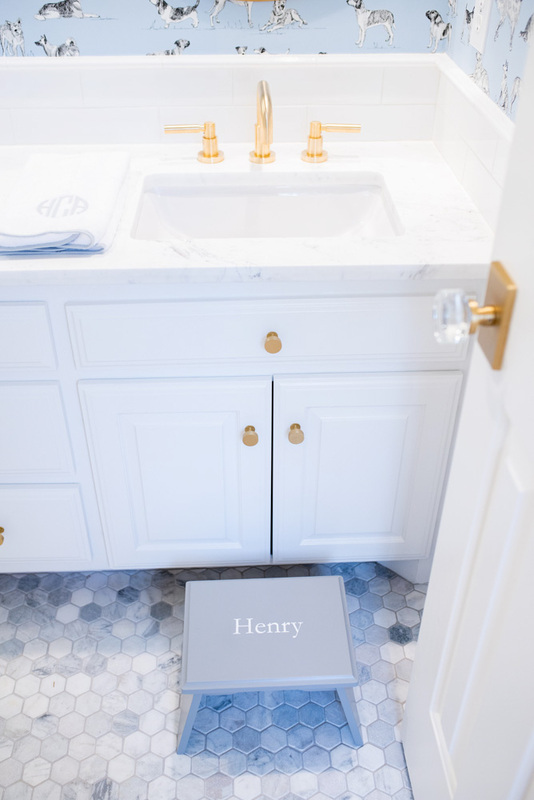 The first tile I found was a honed hexagon marble tile. I loved the shades of gray in the stone and the fact that is was honed and not polished was a huge selling point for me. I do not want to risk my boys slipping on a polished stone! 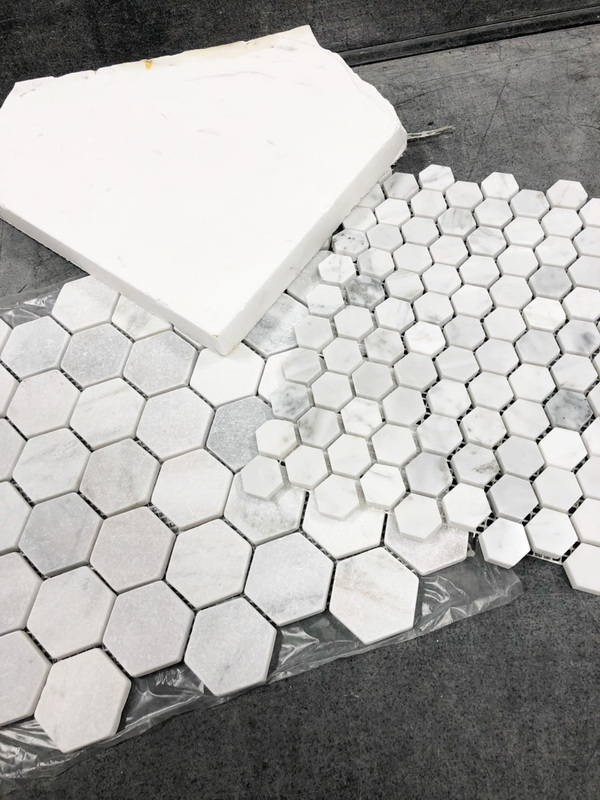 After looking at a hexagon ceramic tile, penny tile, and a smaller polished hexagon, I ultimately decided on the first honed hexagon tile and I am so happy with our choice. My next decision was what to do for the shower surround. With the bathroom being on the smaller side, I knew I wanted to do something light. 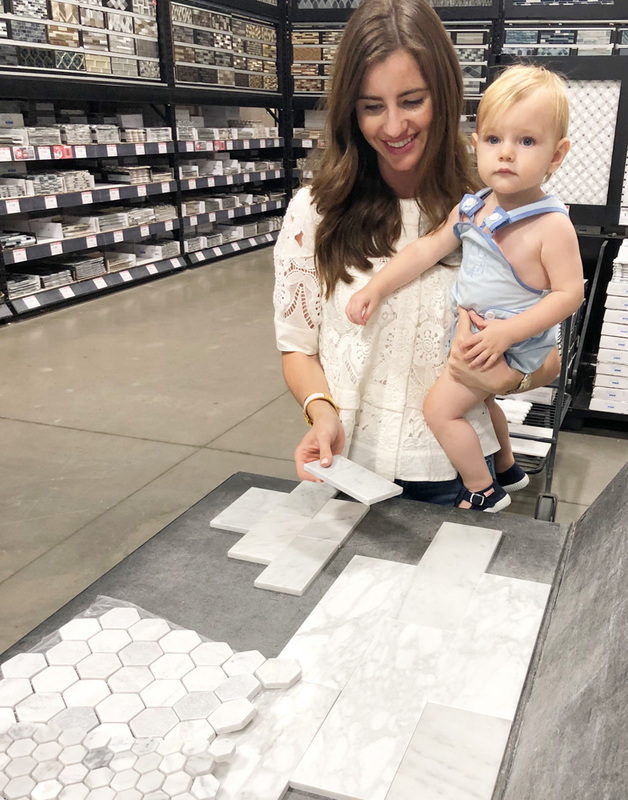 I brought home a lot of different white tiles (Floor & Decor accepts returns on non-installed products, which is a huge plus!) 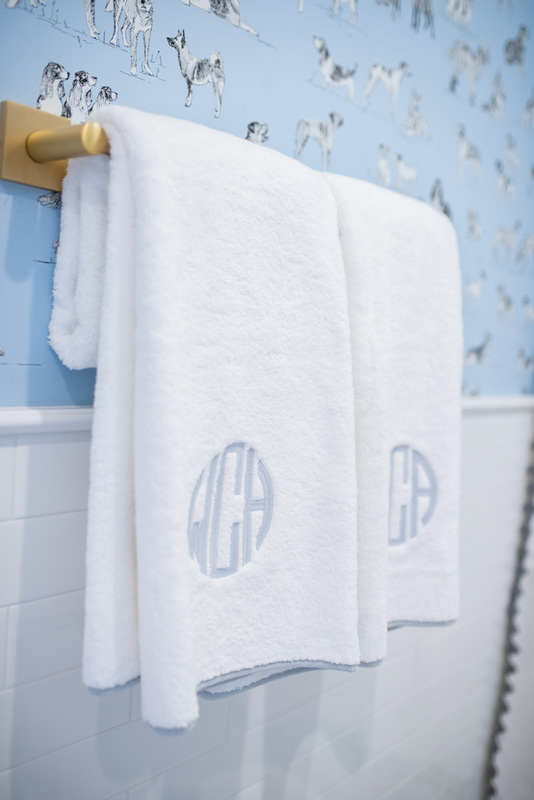 to hold up in the bathroom and next to the boys’ countertops. 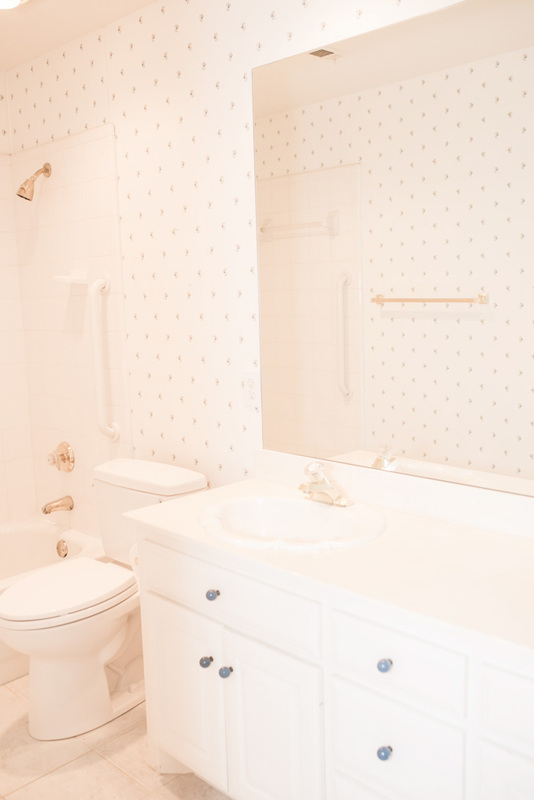 In the end, I selected a simple, white 3 x12 tile in the color meringue. 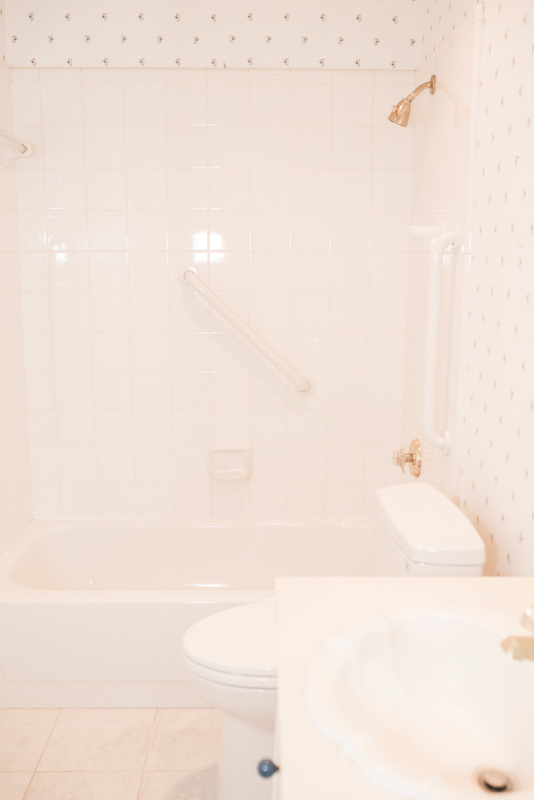 We took the tile all the way up to the ceiling in the shower and I love how that really opened up the space. 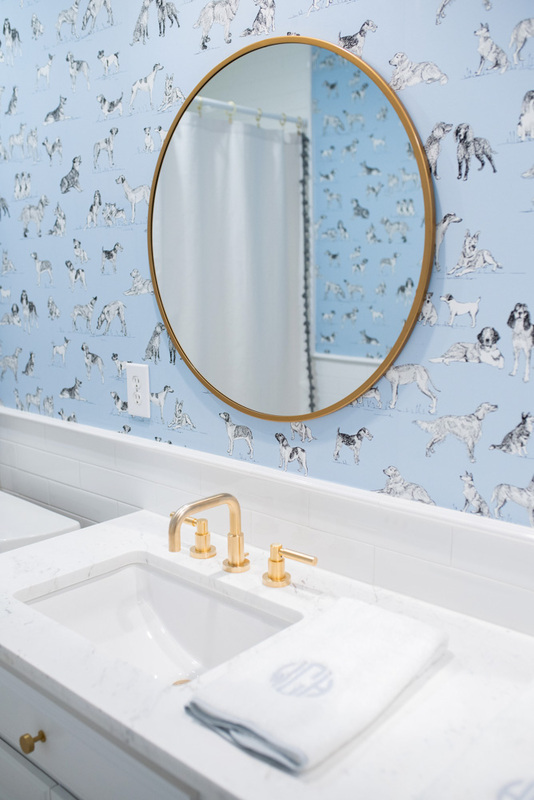 Because I wanted to do wallpaper in their bathroom, I ended up carrying the tile completely around the bathroom up the walls to about 3 feet. That way I can easily wipe off the tile vs. wallpaper from their dirty hands! We used the matching pencil liner to finish out the look. 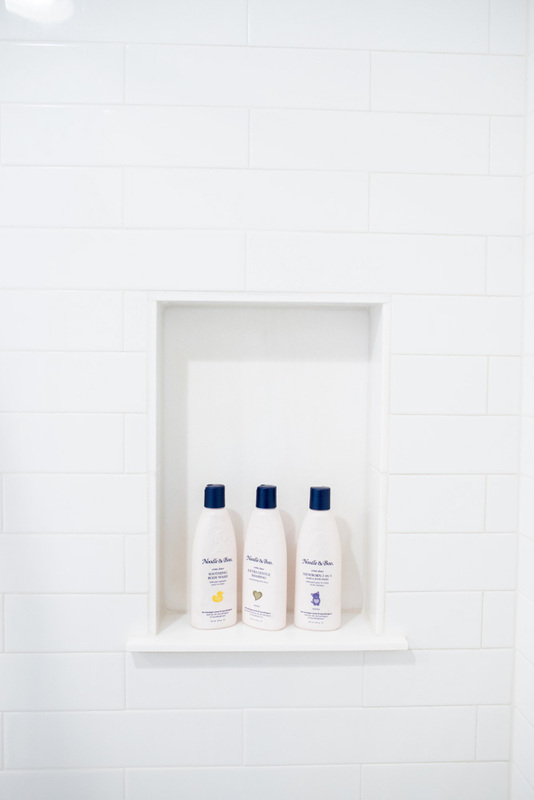 We also built in a small marble niche for the boy’s shampoo, conditioner and body wash. 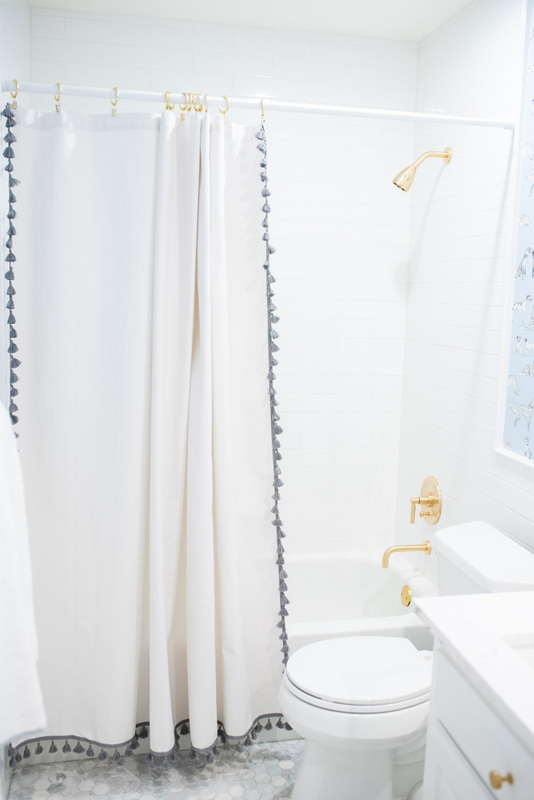 I am so happy with the way their sweet bathroom turned out! 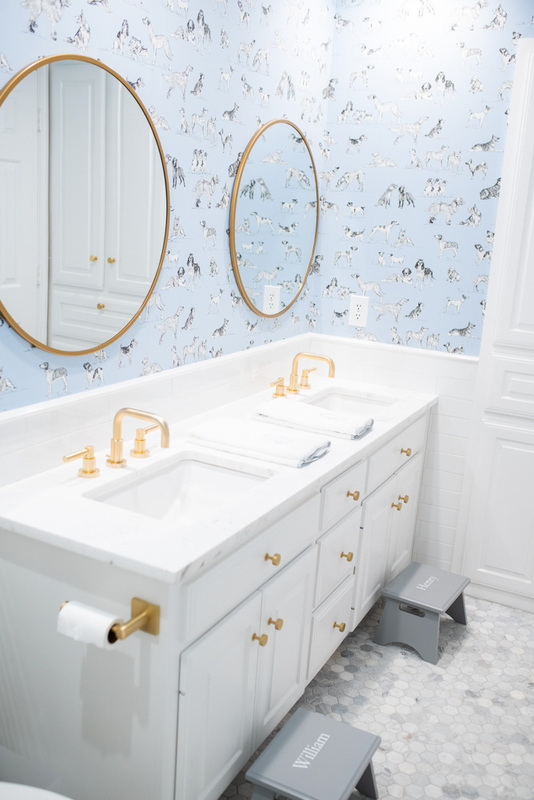 I love the floor tile and the wainscoting around the room, the touches of brass add some warmth and the wallpaper adds the perfect pop! It’s come a long way since the first time we saw the house back in May! What do you guys think of the before and after? 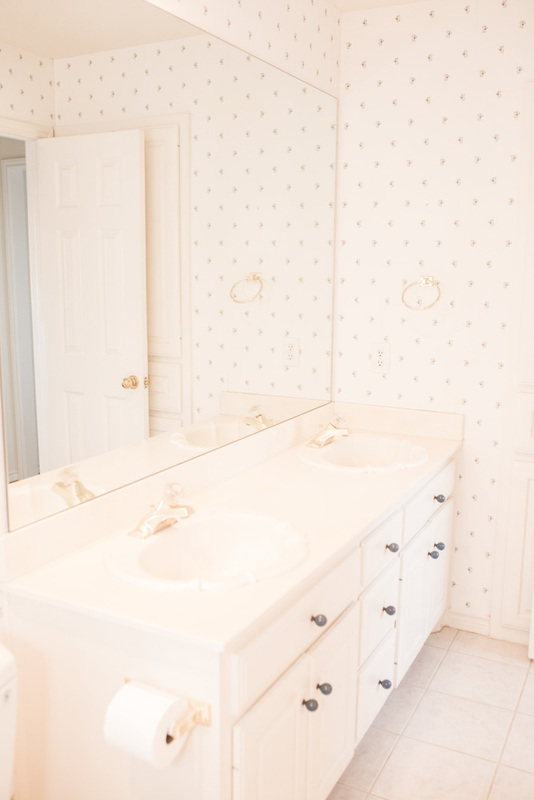 I’ll be sharing all the details as far as counters, plumbing, mirrors, towels, stools, etc, so stay tuned!